On June 21, the 2017 GNI Annual Public Learning forum brought together more than 100 experts, government representatives, students and advocates in Washington DC. Panel discussions and questions from the audience explored current government threats to free expression and privacy in the ICT sector. Addressing extremism, hate speech and disinformation online was a key focus, as well as global surveillance reform and the treatment of non-citizens, and ways that multi-stakeholder engagement can drive a constructive global agenda for free speech and privacy rights online. GNI Executive Director Judith Lichtenberg opened the event with the observation that government pressures on companies are compounding at an alarming rate. These pressures to censor content, disrupt services and provide government access to data make it clear, she said, that the GNI model of principled, multi-stakeholder engagement is more important than ever. She noted that GNI has been expanding rapidly in 2017: adding seven new telecommunications company members, one new company observer, two new NGOs and three new academic members since January. In the first of three learning sessions, Courtney Radsch, from the Committee to Protect Journalists, Sidsela Nyebak from Telenor Group, Andy O’Connell from Facebook, K.S. Park from Korea University Law School and Susan Benesch from the Dangerous Speech Project discussed current efforts by governments – including in Germany and the UK – to effectively outsource censorship to companies. Panelists discussed the difficulty of finding agreed definitions of terrorist content, hate speech and disinformation and examined the extent to which these laws could set dangerous precedents worldwide. From the vantage point of telecommunications companies with infrastructure and staff on the ground, there is an urgent need for sustained, multi-stakeholder dialogue with governments before an election or crisis prompts requests for service shutdowns. They also gave examples of how governments are increasingly turning to “soft” or secret regulations outside of normal legislative processes to restrict service access and censor content. Between the first two learning sessions, GNI Board member Bennett Freeman introduced the two new GNI-Internews Fellow organizations for 2017-18; Colombia-based digital rights advocates Fundación Karisma, and R3D from Mexico are being supported to participate in GNI activities under the fellowship this year. Carolina Botero, CEO of Karisma, and Danya Centeno, legal counsel for R3D, addressed the audience on their current advocacy for digital rights. He announced that 2016/17 GNI Fellow, Paradigm Initiative in Nigeria, has applied for full GNI membership, and will be GNI’s first member from Africa. The second learning session brought together surveillance law and policy experts to put recent debates in the US and Europe into context, with a focus on how different countries treat the surveillance of foreigners abroad. With Section 702 of the FISA Amendments Act set to expire this year, Sarah St.Vincent from Human Rights Watch highlighted concerns about data incidentally collected on US persons under surveillance of foreign targets, both within 702 and under Executive Order 12333. Adam Klein of the Center for a New American Security argued that mechanisms for judicial review on foreign targets under 702 are more rights-protecting than the global norm, and expressed his concern that a failure by Congress to reauthorize 702 would result in the expiration of these and other protections. Moderator Vivek Krishnamurthy, from the Harvard Berkman Klein Center, noted that German surveillance law has been often been viewed as a model. Thorsten Wetzling of Berlin-based think tank Stiftung Neue Verantwortung (SNV) commended the now-codified requirements for authorization of foreign-foreign telecommunications surveillance, while raising questions about the opaque drafting process, and how the new regulations will be implemented. Stephanie Martz from the Reform Government Surveillance Coalition noted that terror attacks in Europe were tilting governments in favor of more law enforcement access to data. Urgent law reform in the US and Europe was needed in the first instance to ensure that access by governments is done so legally, efficiently and in a way that protects privacy and maintains trust by consumers in global tech companies. The final learning session, moderated by GNI Board Chair Mark Stephens, was an opportunity for a bigger-picture look at rights online, and potential multi-stakeholder strategies for improving freedom of expression and privacy rights online – including advocacy with governments and international institutions. 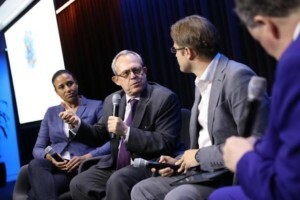 Frank La Rue (pictured speaking above), UNESCO Assistant Director-General and Former UN Special Rapporteur for Freedom of Expression, emphasized that not every new piece of legislation must re-define privacy. Human rights already create a common basis for companies and civil society to engage with governments. UNESCO is currently developing a set of Internet Universality Indicators, via broad multi-stakeholder consultations. Nani Jansen Reventlow, fellow of the Harvard Berkman Klein Center, praised the UN Special Rapporteurs, past and present, for outlining a model for global strategic engagement, one that incorporates multi-stakeholder expertise and perspectives. Nani outlined her newly-launched “Catalysts for Collaboration” project website, which encourages activists and other stakeholders to collaborate across disciplinary silos to more effectively use strategic litigation to promote freedom of expression and privacy. Christoph Steck, Director of Public Policy & Internet at Telefónica, said encryption technologies are a critical part of privacy and security protection, but noted that governments that are denied lawful access to encrypted communications will find other ways to access that information (for example hacking smartphones). He urged that the focus be on the policy question of defining cases and proportionate, lawful access to communication, not only on specific technical solutions. On this issue and others, panelists agreed that multi-stakeholder learning and collaboration, is an increasingly important way of setting standards across the entire ICT sector. GNI would like to offer a special thanks to our speakers, the staff at Google DC and especially Google Free Expression Counsel Alex Walden for all the support given to stage this event.